This property is located in a Conservation area with ornate period rooms but limited views and access to the large garden beyond. The owners of this period house required a new family room and kitchen with a glass extension that seamlessly blended the indoor and outdoor spaces. 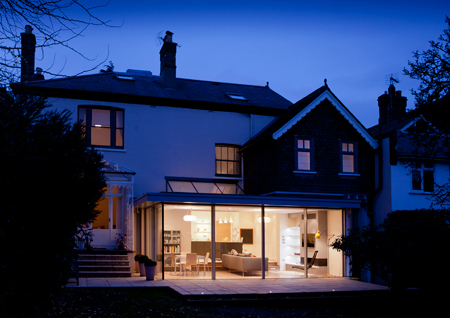 We used structural glass walls with frameless sliding doors to achieve this, with a sloping glazed roof light between the new extension and the kitchen to bring light into the deeper part of the house.